Last week I gave a presentation on photography for architecture, and thought this information would also be useful for exposure settings in 3D for renderings. With mental ray, the values are almost identical to a real cameras settings. Understanding these settings can make it much easier to get the rendering quality that you want...and can also help you take better pictures with your camera! 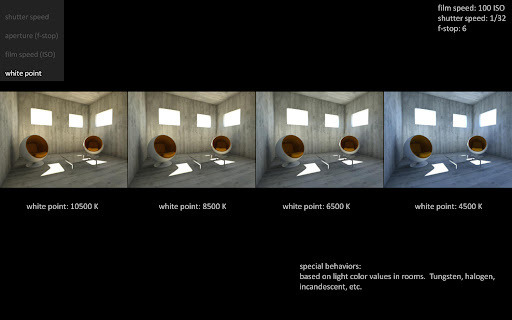 In 3dsMax they all do the same thing (except whitepoint), make your image brighter or darker. But they all react a little different to each other and have some interesting characteristics. The shutter speed value determines how long the shutter is open in a camera. The longer it's open, the brighter the image. Acceptable values are 500, 250, 30. The important thing to remember is these numbers are fractions of a second. So when you see 500, it's really 1/500th's of a second. So the smaller the number, the longer the exposure only up until you get to full second values. So it's important to know your camera. If you see 30 it could be 1/30 of a second or it could be 30 seconds. Just play with the setting to see where you are. I've found that speeds slower than 1/30th of a second on my camera tend to cause blurring if I'm not using a tripod. The shutter speed is also what determines blurry people. If you want a crisp photo with blurry moving objects, use a tripod and leave your exposure open for 1 full second. The aperture is how wide the lens is open. This value is called f-stop, and the lower the value, the wider the aperture, the brighter the image. In reality the f-stop is a factor of the focal length. For example if you are using a zoom lens at 17mm, you could get your f-stop to be as low as 3.4...but with the same lens if you are zoomed in at 100mm, your f-stop value can only go so far to maybe 4.0. Depth-of-field (DOF) is also a factor of the f-stop number. Typically the lower the f-stop number, the more of a DOF effect you can get. Because we deal with exposure in 3D there is no limitation to the f-stop value. In mental ray, f-stop doesn't affect DOF, whereas in v-ray, if you are using a v-ray camera, DOF is affected by f-stop. Traditionally before digital cameras, you had to choose what film to put in your camera and it had a fixed film speed (ISO) value. Higher values are more sensitive to light, but noisier; whereas lower speeds of film are less sensitive to light, but are sharper. Because a digital camera doesn't use film, this value is purely fictitious and simply imitates what ISO used to be. The advantage to a digital camera, and renderings is that on the fly we can change the ISO value without having to change film. The difference between your digital camera and rendering though is that when you increase your ISO values in 3D, the rendering does not become more noisy. So when a photo is taken at these different values, the images can turn out to be red or blue depending on the lights in the space. Whitepoint actually counter-acts the colors of the lights to even out the color in the image/rendering. So lower values of K will result in a bluer image while higher values result in more red images. This should help you begin to understand the art of light, and help you to start seeing things in terms of these values. They each affect the other. So play with them and know how one will make the other value work. When you master this, it should definitely give you a leg up when you are working on lighting those renderings. thanks a lot, this post is really usefull, was looking for a smiple explanation for ages! This blog is my new number one resource for 3D info. Excellent work, buddy. I love this blog too, i like when people explain me HOW thing works. Normally what you get is people explaining stuff as if you were a 5 year old "Do this, then do that, and there you go" without explaining what's really going on. I really need an article like this. I started learning to use the camera. good! really help me. I have a question about configuring v-raycams and light settings. what should i do first? do i set de light to a fixed value and configure the cam or should i set the cam to a fixed value and then configure the lights? Very Good!! It helped me a lot!!! Actually, in MR the f-stop also influences the DOF. Just check in the standard Max camera "use MR DOF" or go to the rendering panel (F10) and you'll see that you need to specify the f-stop in order for the DOF work properly. Also, I think that in your in your last image, the kelvin values are mismatched (you said lower values gives us more red images, but that's not what one can see in the picture). But lower color temperature results in more red images and the contrary ! Tungsten/low sun are around 3000/4000 K and gives an orange light. Cloudy day light is around 10 000 K which is almost white. We just say it's a "colder" color because it's blueish but the temperature is higher.